kristy.makes: life: did you know? & i know she means well. but she is CONSTANTLY feeding me little tidbits concerning weight loss. it's always.. "i was reading in this magazine"
or... "i read this email"
or... "i saw on tv"
i always hear her out, but very rarely do i apply what she tells me. it's not outright disregard, it's more like not remembering what she said. but i remember a few things. and i've tried to start implementing them in my new diet. did you know that cinnamon is a metabolism booster? it is. my mama told me so. and good housekeeping says so too. 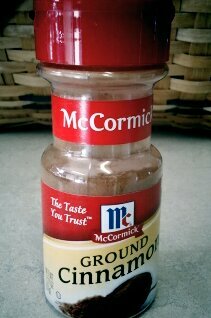 i just sprinkle it on top of a lightly buttered piece of whole wheat toast. & it's a jump start for my day. but if you don't like cinnamon, they make it in capsules you can take like a pill. over the years she has also told me that..
so. my mama told me & now i'm telling you. I thought they made the capsules to be thoughtful for diabetics...cramming that much cinnamon in each meal can be a real chore (in case you missed the part where cinnamon is monumentally good for diabetics' glucose levels :p ) Never even thought about who else they are marketing them to, heh.